While visiting Brazil recently, I got the opportunity to interview the graffitist, plastic artist and photographer Zezão. Emergent from the third generation of graffitists in Brazil, Zezão, 41 years old, started to do graffiti in 1995. 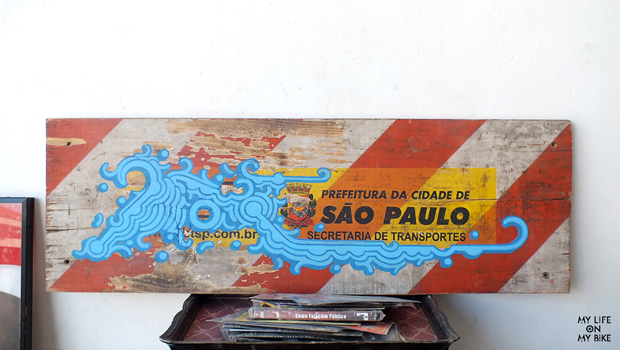 In 2003, Zezão was discovered in Brazil after posting pictures on Internet of his work on the underground sewer of São Paulo city. 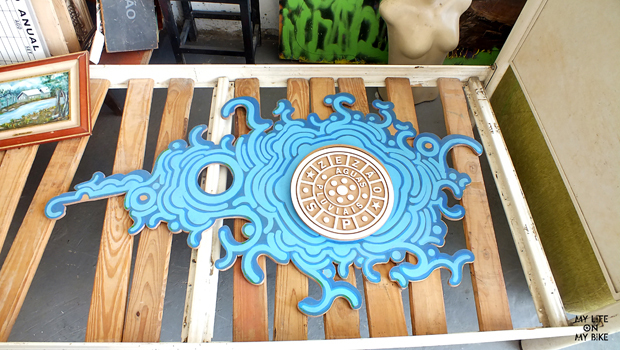 His famous FLOP, a signature derived from ‘flow up’, is an organic blue form, abstract, with tribal influences and the handwriting can be found in favelas, walls, sewers, bridges and abandoned places contrasting the rudeness of this environmental with a dedicated and clean light blue. Zezão grew up on the periphery, didn’t conclude high school and lost his parents too young. He worked hard as a motorcycle courier and suffered from depression. 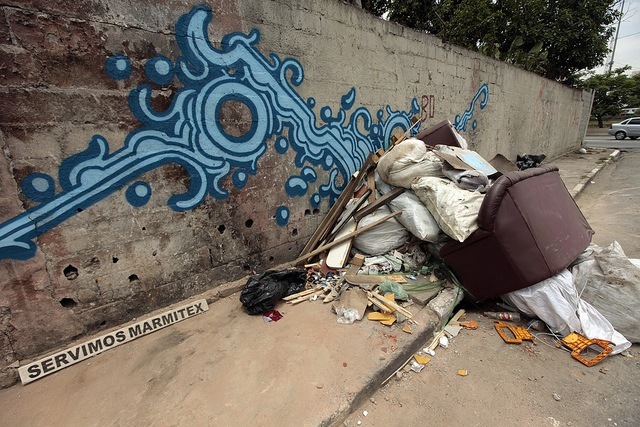 Zezão is a self-taught artist, in love with the “maloqueiragem” (the culture of those that live the streets) and with the garbage he uses to make his fine art. He can walk freely in the poor periphery, but also in fancy galleries around the world. 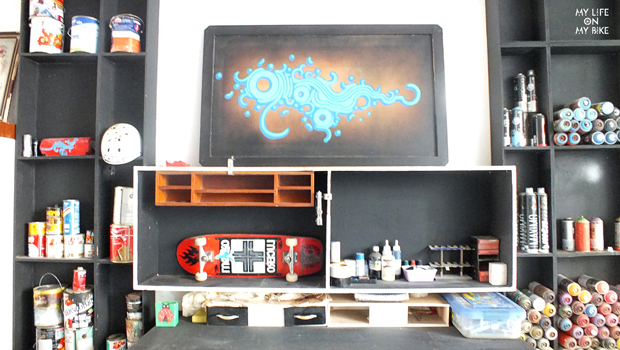 The interview was booked in his new studio at the neighborhood of Bom Retiro, in São Paulo, a place that approached me again with my old mitie (see my history related with this neighborhood on my interview with the Brazilian artist Rafael Suriani, who is based in Paris). 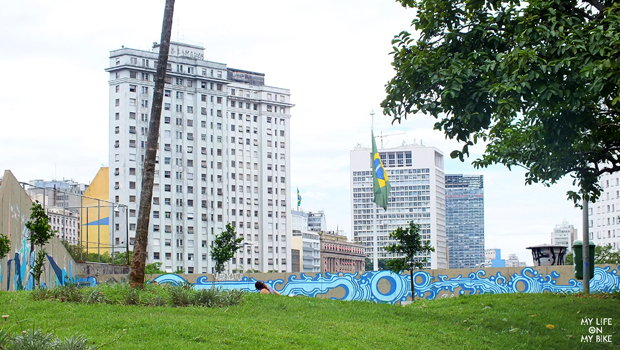 Bom Retiro is a neighborhood where I used to go for ten years during my time working with fashion, a place that faces a drug point in downtown São Paulo. My readers already know how I believe on the universal laws of synergy. Once again, the Universe connected me with an artist that does more than an aesthetically beautiful art, but also political, social, ecological and genial. Zezão is a noble soul, which I perceived during the interview. He gave me a class about the power of extending our hands and giving opportunities for other human beings, facing prejudice and transforming a marginalized life for the society. When the interview happened (last February), Zezão was preparing his current show, ‘Lembranças de um passado adormecido” (“Memories of a past asleep”) for the gallery Athena Contemporary in Rio de Janeiro. I had the first-hand chance to photograph some pieces of the show and also understand the concept of this incredible series of work. 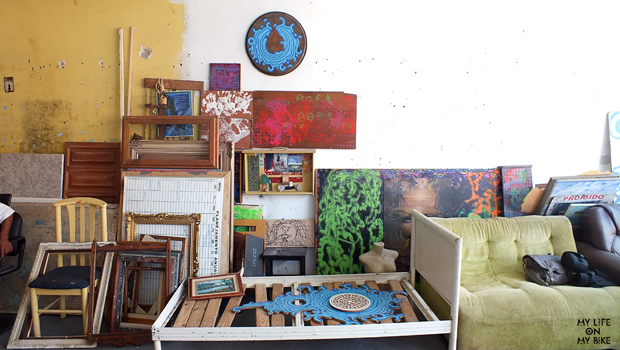 Zezão rented the building of his current studio at the end of 2012, a place that used to be a spot for drug sellers, a trespassed boarding house with a lot of rubbish. While looking for carters to help him clean and organize the place, Zezão decided to give this opportunity for people who lived close to the Cracolândia. He said that on the first day, ten people came to help, on the second just half of that, and gradually decreasing. But one of these addicts was very willing to work, he used to arrive early and stay until very late, an unfeigned worker that kept Zezão’s attention. His name is Cícero Rodrigues, also known as Índio. Índio used to be a homeless that survived as a dustman. He was born in Pernambuco and four years ago he decided to move to São Paulo, where he arrived 50 days after, barefoot and unrecognizable because of the sun. After understanding the history of Indio’s life, Zezão revealed his true story, that his art came from garbage. The garbage was an extraordinary way to connect these two human beings. After gaining Zezão’s trust, Índio started to reduce the drug and started to be Zezãos’ “right arm” at the new place. Índio for the first time felt respected for his work and history of life. Zezão, on the other hand, saw a chance to transform a drug addict and marginalized guy into a true citizen. For Zezão’s current exhibition, done mainly with beds headboards, Índio found more than 30 types of this object on the streets. Beyond paying for his work, Zezão offered Índio the opportunity of a home, is also providing Indio’s documents (which he didn’t have, and was living as an indigent) and teaching him to make art. 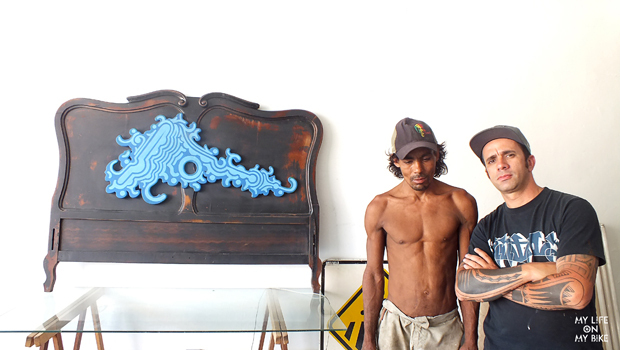 He also wants to pay Índio a commission for each sold piece made with the headboards. A friendship and complicity were born from this beautiful partnership, where both earn materially and spiritually. Zezão confessed having suffered prejudice from close friends, because they couldn’t understand his relationship with a person considered marginalized by society. But for Zezão it doesn’t meter, he can’t deny his roots and his desire to help other human beings, it’s is stronger than just keeping appearances. I could feel from Índio a huge gratitude for the opportunity that Zezão is giving him. Also, I could note how one single life can be transformed through a noble heart like Zezão. 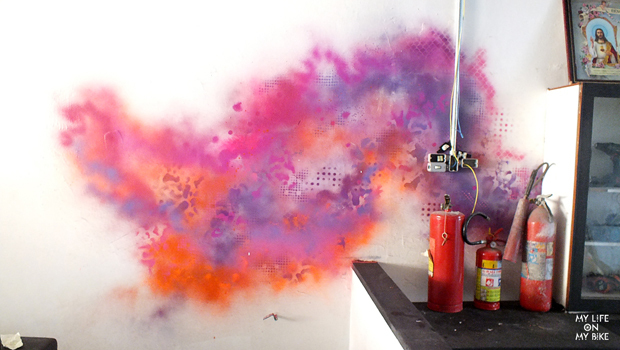 To know more about Zezão’ street art, check the entire interview for the site Underground Paris.